Get started juicing with a high-quality juicer, like the Breville Fountain Plus. To juice whole, fresh produce into delicious nutrient rich juice everyday you will need to buy a piece of kitchen equipment called a juicer. Trying to work with kitchen knives and an ordinary food processor or blender is NOT going to cut it. 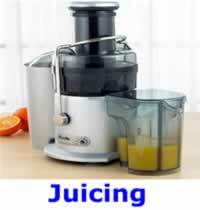 Reasonable criteria for selecting a good juicer would be durability, ease of use, and, most of all easy cleanup. Hard to clean equipment simply does NOT promote regular use. People who have gotten burnt on cheap equipment, one too many times, know that it is much more economical to buy quality up front than it is to have to purchased another piece of equipment in a year, or two. Rather than waste your money on worthless junk, why NOT invest in a quality piece of equipment, like the Breville discussed in this article? 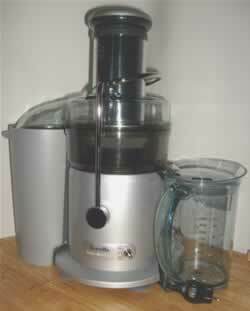 A lot of people take their juicing very seriously, and buy really expensive juicers. You can actually spend as much money on a juicer, as some people spend on an automobile such as the Waring Juice Extractor. Our recommended Breville Fountain Plus Juicer is comparable to the Jack Lalanne PJP Power Juicer Pro Stainless-Steel Electric Juicer which retails at a similar price. It is a heavy-duty centrifugal juicer, as opposed to the more expensive single gear juicers, that essentially shreds produce into fine, dry pulp. The reviews at Amazon.com clearly indicate that the Breville model is a much better juicer. For ordinary family use, you will be hard pressed to beat the Breville JE98XL Juice Fountain Plus 850-Watt Juice Extractor purchased on the Internet from a vendor that you can trust: Amazon.com. Far too many local retailers are trying to sell junk juicers to the public. The Natural Health Perspective uses the very same Breville Fountain Plus juicer daily to test out and develop all our juicing recipes and articles. Easy clean up - All parts except for the mesh filter basket and food plunger can be washed on the top shelf of the dishwasher. Uses a standard heavy-duty Single Pole Double Throw (SPDT) switch for easy self-repair in the remote event that the power switch ever breaks. Much fuss has been made about cleaning juicers. Food does NOT cook itself, nor do dishes cleaned themselves. This Breville juicer is so well designed that it takes very little effort on your part to keep it clean. People make to much out of having to clean a juicer. Joe Cross in his Fat, Sick & Nearly Dead Film traveled across America for 60-days, cleaning his Breville juicer in the back of his SUV. Joe's road test documents just how easy it is to clean a Breville juicer. Be sure to clean out your Breville juicer immediately after each use under cold running water. Use the stiff nylon bristled brush that came with your machine to clean off the food basket strainer. Using hot water and soap to clean your juicer is really only necessary every three or four days. Plus, your can put most of the Breville juicer parts on the top self of your dishwasher, for an even easier cleanup. If you can clean your produce, then cleaning your juicer shouldn't be a problem. Be sure to line the pulp container of the Breville juicer with a recycled plastic bag from shopping or the grocery store, before each use in order to minimize cleanup. This article was originally published on 12/01/2012.